100% Natural Stevia Sugar Free derived from Stevia herb. Directions for Use : Use a spoon of GoodSWEET (Spoon Provided inside this pack) for a cup of Tea/Coffee / any other beverage. 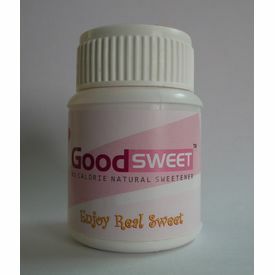 GoodSWEET is a natural stevia sugar-free derived from a sweet herb – Stevia rebaudiana . It is a Pure extract of Finest Stevia , a world known alternative sugar plant. It contains glycocides which is 150-170 times stronger than cane sugar. GoodSWEET is a natural taste enhancer with Zero Calories. Stevia is more ideal for diabetic and calorie conscious people . GoodSWEET is a heat stable , and can be used in hot & cold beverages as well as in cooking & baking. Mfd Date : March 2018 ; Expiry : Sept 2019. 100% Natural Stevia Sugar Free derived from Stevia herb. Safe for Diabetics & Hypoglycemic Anti Oxidant Promote Oral Hygene Zero Calorie Natural Sweetener Net Content : 10 gms (for 100 cups of tea / coffee – use spoon provided inside the pack ) Directions for Use : Use a spoon of GoodSWEET (Spoon Provided inside this pack) for a cup of Tea/Coffee / any other beverage. GoodSWEET is a natural stevia sugar-free derived from a sweet herb – Stevia rebaudiana . It is a Pure extract of Finest Stevia , a world known alternative sugar plant. It contains glycocides which is 150-170 times stronger than cane sugar. GoodSWEET is a natural taste enhancer with Zero Calories. Stevia is more ideal for diabetic and calorie conscious people . GoodSWEET is a heat stable , and can be used in hot & cold beverages as well as in cooking & baking. Mfd Date : March 2018 ; Expiry : Sept 2019.